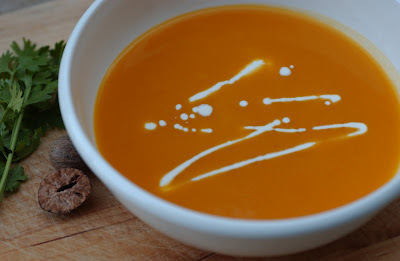 This is another one of our favorite soup recipes, and a good, not so sweet alternative to the carrot soup. Light, healthy, vegetarian, simply yummy. Easy to make, and it might even be good to tidy the fridge off some lonely onion, potato or carrot. This is, what I often find in the deeps of my fridge......... Just buy a big piece of pumpkin and dinner is saved and fridge cleared. Peel potato, pumpkin and onion and cut them plus the carrots into chunks. Fry in the oil for a few minutes. Add water and the vegetable stock cubes. Bring to boil and simmer until all vegetables are soft (10-15 minutes). Blend the soup and cream. Season with nutmeg to according to taste. Sprinkle with cut coriander before serving.